In case you are unaware, there's a General Election happening in the UK. We go to the polls on May 7th in what promises to be the most exciting campaign in living memory. Back in January on textwrap I looked at classic campaign posters from the latter decades of the Twentieth Century. These were the halcyon days of the two-party system in the UK, when the battle between Labour and the Conservatives (Tories) was consistently brought to life through superb political poster design. Today, that two-party system is at an end. We've had a coalition since 2010, and further fracturing of political allegiances means that multi-party politics is here to stay. This change presents interesting problems for the advisors, spin doctors and agencies running the various campaigns. 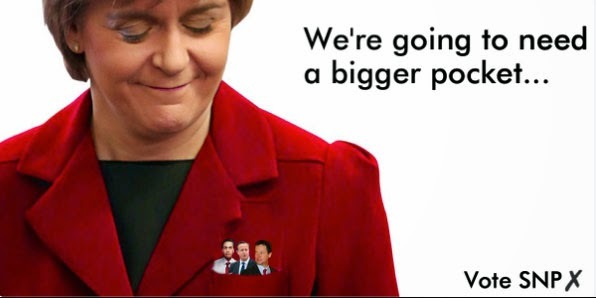 The situation in this election is that Scotland's left-leaning Nationalist party, which has enjoyed huge post-referendum support under the auspices of the popular and capable Nicola Sturgeon, is threatening to secure the bulk of seats north of the border, leaving Labour and the Conservatives to fight it out in England for a minority win that may well require SNP support to form a majority bloc. Confused? If so, then perhaps it can be neatly summed up by the defining piece of political propaganda of the campaign - a Tory poster depicting the Labour leader Ed Miliband in the SNP's Alex Salmond's pocket (a tad confusing given that Salmond isn't actually the SNP leader, but the meaning isn't altered by that fact). 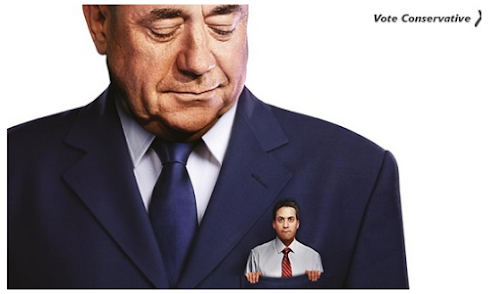 The poster, designed by M&C Saatchi, is aimed at English voters and is intended to warn them against the danger of a Labour minority government supported by the more politically-adept SNP in coalition. This is because consistent polling by a variety of pollsters show Labour losing most of their 41 seats in Scotland. And a combination of Labour and SNP seats (in coalition or lesser arrangement) would command a majority over Conservatives in any 'hung' parliament. Ironically however, the very opposite of the message contained in the poster is communicated to other audience i.e the Scottish electorate, many of whom see the poster as an affirmation that real power is on the way. So much so that the SNP appropriated the concept for their own parody version (with a minor nod to 'Jaws' in the strapline). This little episode illustrates the complex dichotomy of the election, and highlights the difficult task facing spin doctors and agencies across all the parties in their attempts to pander to two distinct audiences. Earlier this month, a tabloid newspaper managed to sum up this duality, with a startling strategy to play off opposing target audience mindsets. The Daily Mail is a right-leaning, Conservative supporting tabloid newspaper, published in London. In Scotland, where the Conservatives hold only one seat and are perennially unpopular, the 'Scottish' edition Daily Mail promotes equally right-wing content, but is more mindful of the centrist sentiment of many Labour and Tory supporters. For example, in Scotland, issues of immigration are less contentious. So, after a nationally televised Leaders debate, when various polls and the media in general surprisingly awarded the best performance in a Leaders Debate to Nicola Sturgeon (whose SNP support separation from the Union, and can only be voted for by Scotland's 8% of the UK electorate), the Daily Mail went into overdrive to attack Sturgeon for the benefit of both audiences. The paper ran two conflicting front page headlines the following day. 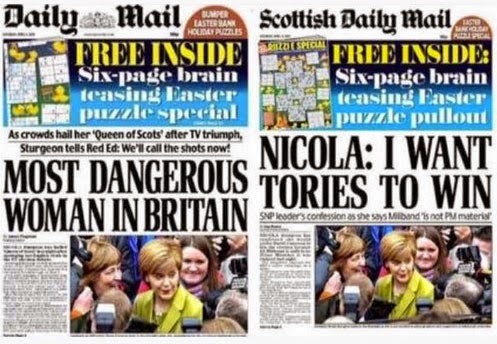 On the left, the Daily Mail warns its Conservative readers, and blatantly scares centre-ground or swinging voters of the real and present SNP threat to the continuation of the Union. On the right, the Scottish edition turns this on its head, essentially stating that Sturgeon in fact secretly supports the Conservatives - the complete opposite of what the Daily Mail is telling its English readership. This angle refers to a comment in a leaked memo which the First Minister was alleged to have made (and which has since been broadly denounced) that she'd prefer the incumbent, David Cameron, to remain in office, in effect lying to her own supporters. This then tempts wavering Labour and SNP supporters actually vote Conservative. And therein lies the dichotomy of the central message. In England, vote Conservative to return the party to power, and avoid an SNP/Labour government. In Scotland, vote SNP to return a Conservative majority. Two completely opposite voting intentions supporting the same outcome. This complicated spin shows how a message can contradict itself and still make sense to the target audience(s). More broadly, it underlines the increasingly untenable political 'union' the editorial seeks to protect.